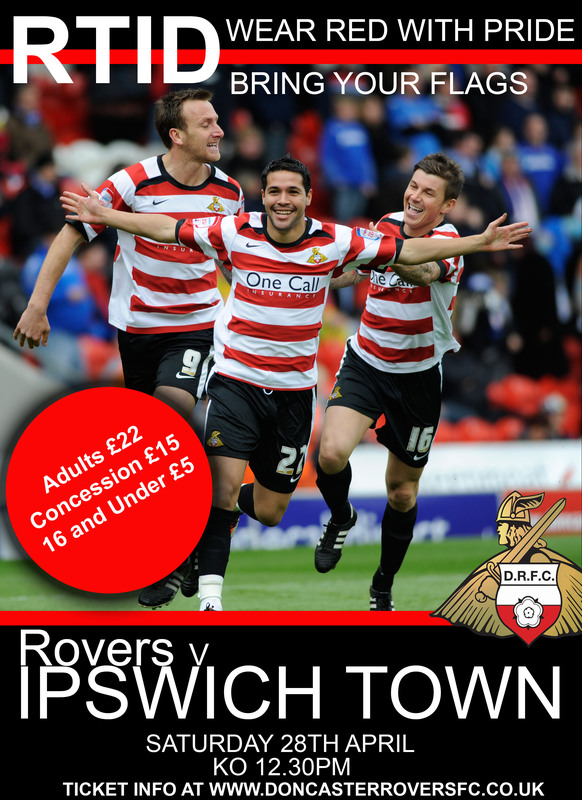 Saturday 28th April 2012 marks the day the Rovers play Ipswich Town in our last nPower Championship match before our (hopefully short) sabbatical in League One. The Club and the VSC would love it, just love it (in the style of another Doncastrian son) if we could say goodbye to this Division in the same way we said hello to it at Derby County, some 44 glorious months ago - with colour, passion, deafening support and our heads held high. This season has been difficult for a number of reasons, but in the words of John Ryan, "Please keep the faith and back the club in every possible way you can", and what better way to answer that rallying call than turning up at the Keepmoat stadium to see the club bow of this Division and maybe, just maybe, show a team finishing this campaign comfortably mid-table a thing or two on the way? Wear your colours, bring your flags, and cheer the team on to one final victory in the Championship. Remember, its an early kick off (12:30pm).